Want to bring out the inner 1930's starlet? Now you can with this high class costume wig. 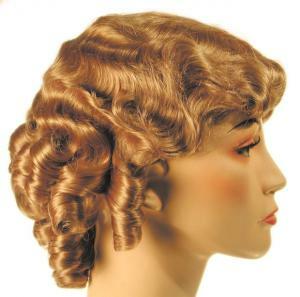 The soft wave curls of this beautiful wig combine to give the glamour and glitz of the 1930's. Not to mention the multiple color variations that will enhance anybody's beauty and charm. These were the years that formed the greatest generation, from saddleback shoes to the great dustbowl. Heroes emerged from the ashes, and rose to amazing heights. This wig can be used for any swing costume, any poodle skirt, or any jumper that you can find. Honor them by dawning these wigs.